After many weeks working hard on a major home improvement project (adding on a living room and dining room) we needed a break. We decided to hitch up our vintage 1955 Airstream trailer, Moonshadow, and head south to join 40 other Airstreams for a New Year’s Eve rally at Picacho Peak, Arizona. On December 27th we gladly left dreary cold and snow behind. The first day on the road we went as far as Burro Creek campground, a beautiful spot and popular birding location in Arizona. 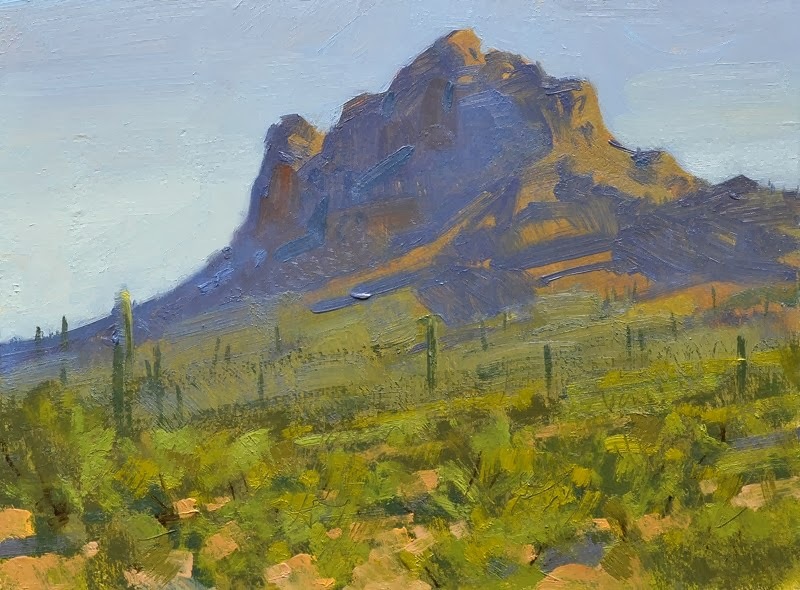 Picacho Peak: warm sun at last! Even though our home is now much larger with two new rooms, we were getting cabin fever and after a long spell of sub-zero temperatures, we were more than ready for a change. At Picacho Peak, just north of Tucson, it felt like a summer day in Parowan. We thought we were here to celebrate the New Year, not Christmas! I guess Santa needs to get away from cold weather too. Five days and nights camped amongst other Airstreamers, we had afternoon happy hours for socializing and sharing good food and drink. Pictured here: New Belgium Brewery of Colorado’s “Accumulation” IPA with Airstream in the snow label, a winter seasonal brew. Nightly bonfire and b.s. sessions. 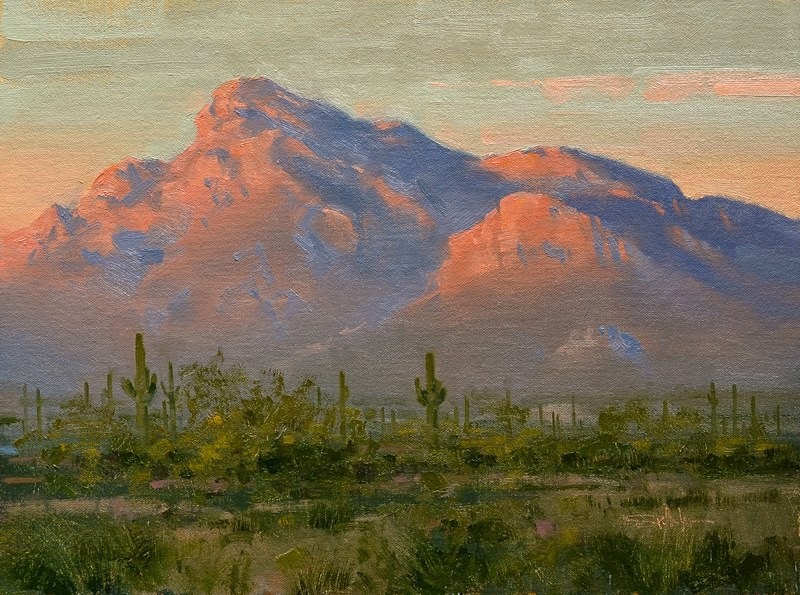 Spike spent daylight hours painting rocks, arroyos and saguaros. The last day of 2013 we gathered for a White Elephant gift exchange. Gifts ranged from the bizarre to the awful with a few good things mixed in. That night we rang in the New Year around a blazing campfire with plenty of champagne. The evening glow on the surrounding mountains was pure eye-candy! 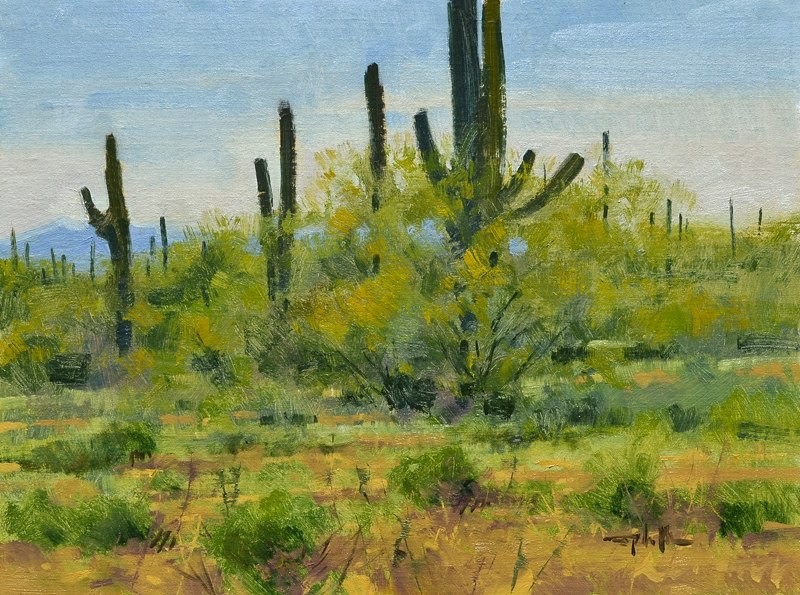 We began 2014 by moving further south to Saguaro National Park, just west of Tucson. 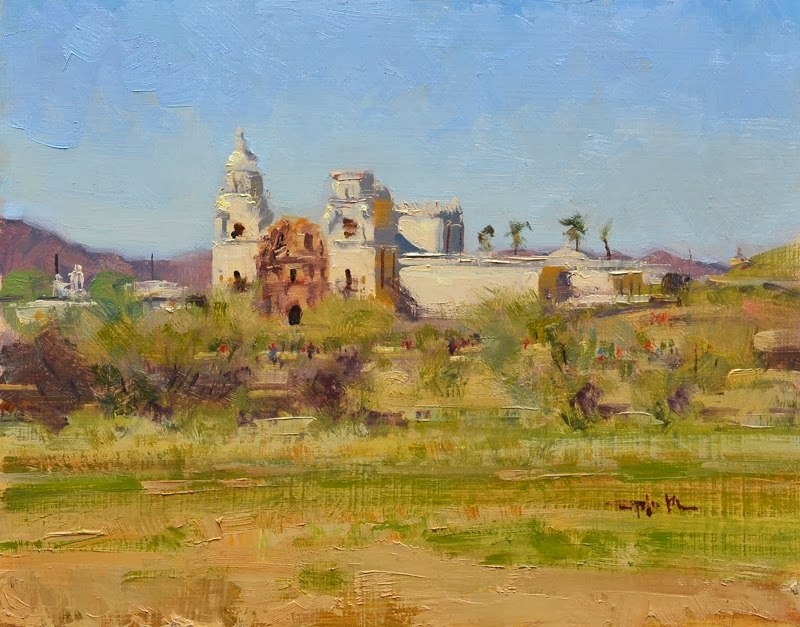 We camped three nights at a county run campground and made day excursions for painting into the park and to San Xavier de Bac Mission and Tubac. It was amazing to see how green the desert was this time of year. where we planned to camp a night or two. Crossing Navajo Bridge gave us a spectacular view of Marble Canyon and the Colorado River. At Lee’s Ferry campground we grab the best campsite. For years we have lusted for this primo site which overlooks the river. Now, in the cold January weather, with the campground virtually empty, we have our pick of sites. 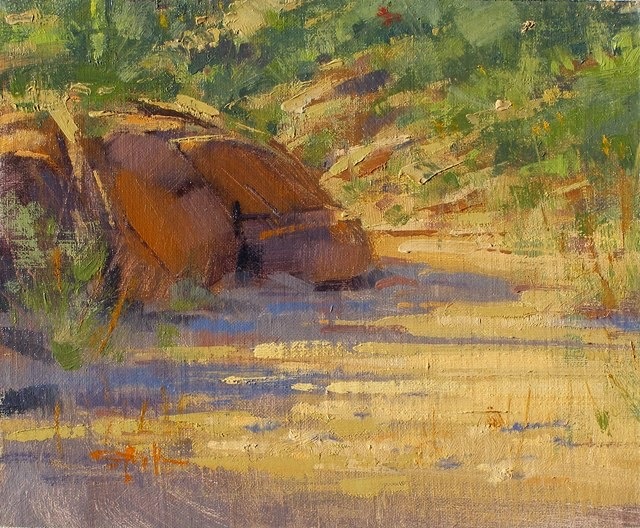 Marble Canyon Tributary, small 9x12'' oil. One last chance to get in some painting time. We stay two nights. 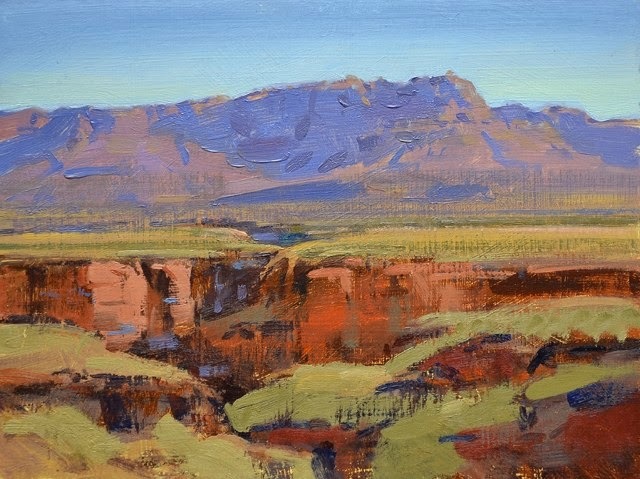 Our last evening here, as the sun sets, warm light glows on the canyon wall above the cold river.